Today at work I got my usual “trouble” from my co-workers about not having very many cookies lately. I know that they just do it all in fun, and I really like that they enjoy what I bring in enough to ask for more. Then I went into my boss’s office to discuss something with him, and he wanted to make sure that I know that they really are just kidding with me. He said that when he was a kid he never really was a big sweet fan; even to this day he usually goes for more salty snacks. This got me thinking about a suggestion that Karl made awhile ago: come up with something non-sweet to take and share. His thought is that a little variety can’t hurt! And then I remembered a soft pretzel I had seen online a few weeks ago. So I came home on a mission to make my first salty snack! Let me just warn you up front that this recipe is pretty time intensive. I tried making pretzels one other time with my friend Natalie, but we didn’t really notice how long they took because we just sat and chatted while the dough rose. You know what they say – time flies when you’re having fun! Tonight I was home by myself since Karl is working overtime, and I didn’t get started until about 8:30pm. It is now 11pm and I just took the last tray out of the oven. So make sure you can dedicate a small chunk of time to babysitting these puppies! The original recipe called for a dark amber ale, but I was afraid that a dark beer might be too strong and bitter for my taste. Instead I opted for a classic pale ale. 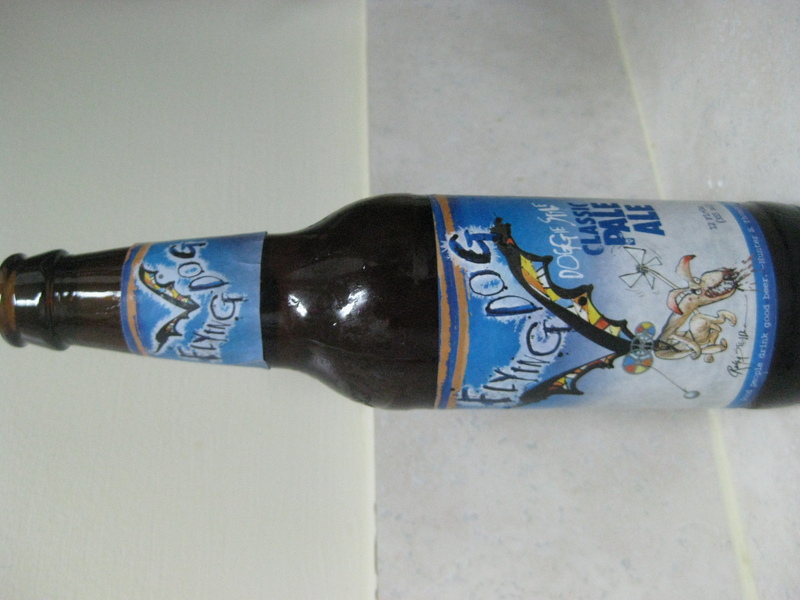 The one I chose, Flying Dog Classic Pale Ale, is actually brewed and bottled at a local brewery here in Maryland. We like to support the little guys! And I just read on their website that as of July 1 they started giving tours again (they stopped in Dec. 2009, just in time for us to get out here). We will definitely have to take a tour this summer! 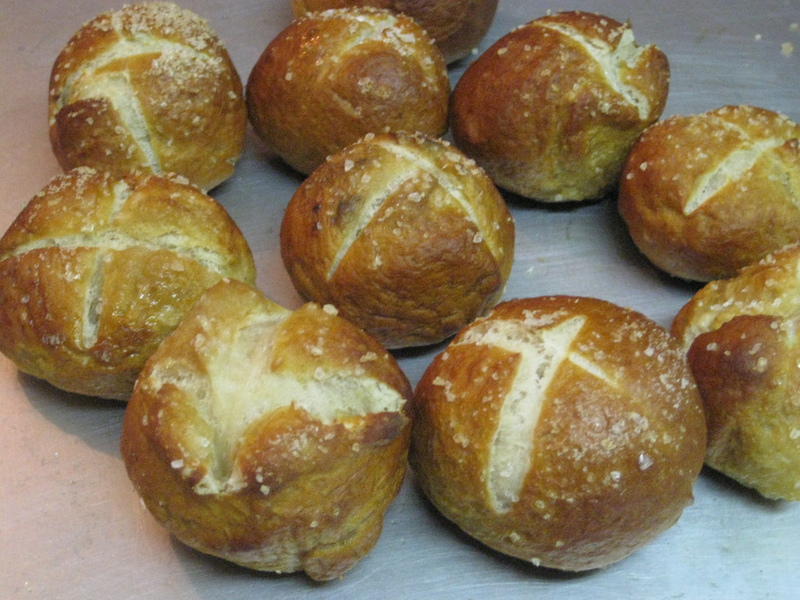 Anyway, the beer does give a little extra flavor to the pretzel, so if that is something you are opposed to you might want to try something a little lighter. 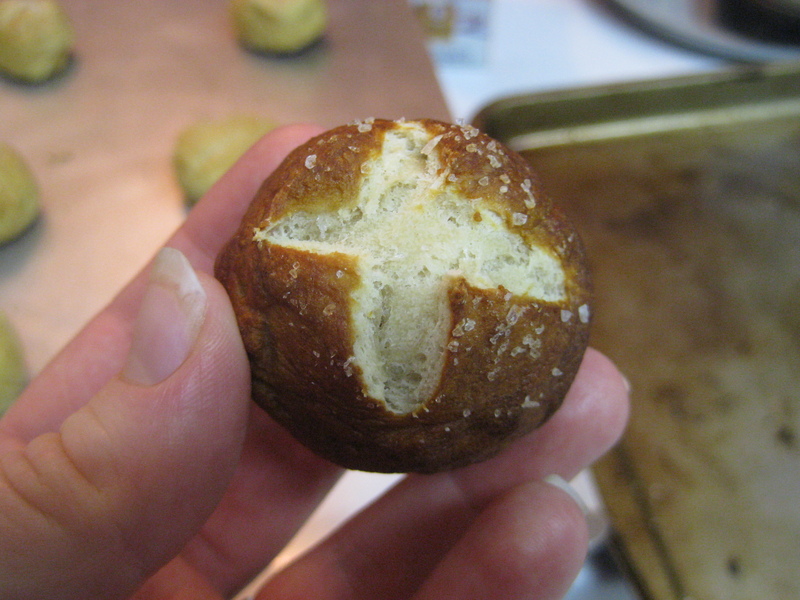 I like it though because it gives the pretzel a little more depth. Also, the original recipe called for 1 cup of whole wheat flour and 3 cups all-purpose flour, but we have never had whole wheat flour in our house so I used 4 cups all-purpose flour instead. I would think that you can use whatever ratio of wheat/white flour you prefer! 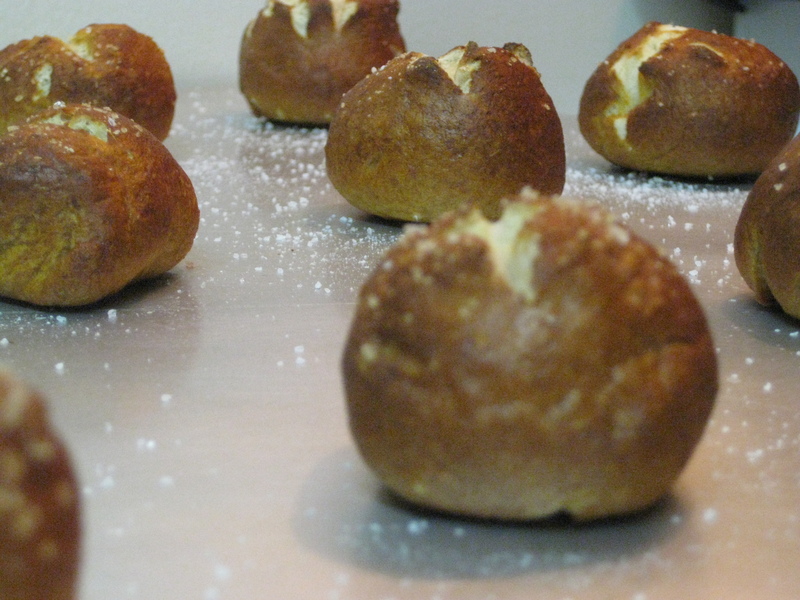 These little pretzel bites would make a perfect appetizer for your summer get-togethers and would also be a great dish to make when you have people over to watch the big game. Your kids will love them too because they are just their size! So, without further ado, here is the recipe. I hope you enjoy them! Combine the beer, brown sugar, salt, milk, and yeast in the bowl of an electric mixer with the paddle attachment in place. Begin mixing on medium-low speed and gradually add in 1 cup of flour and the butter. 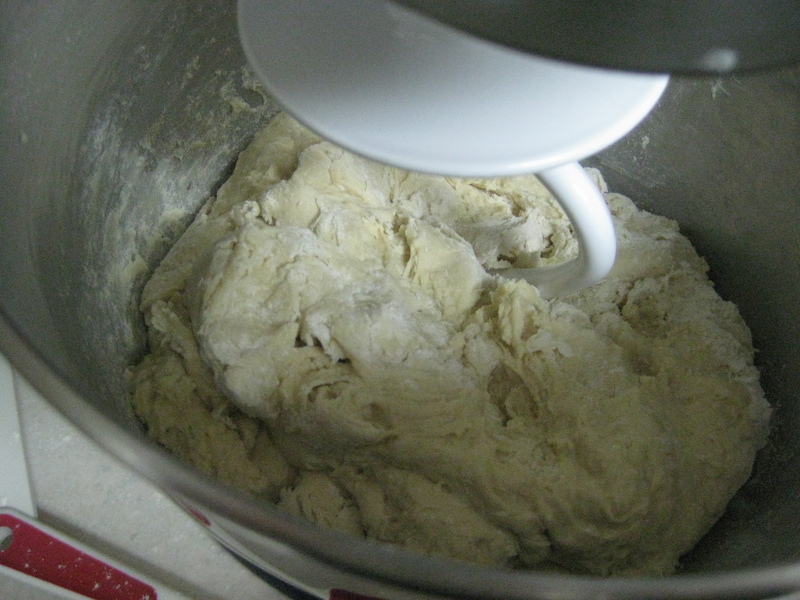 Continue adding the flour gradually on medium-low speed until the dough becomes stiff. 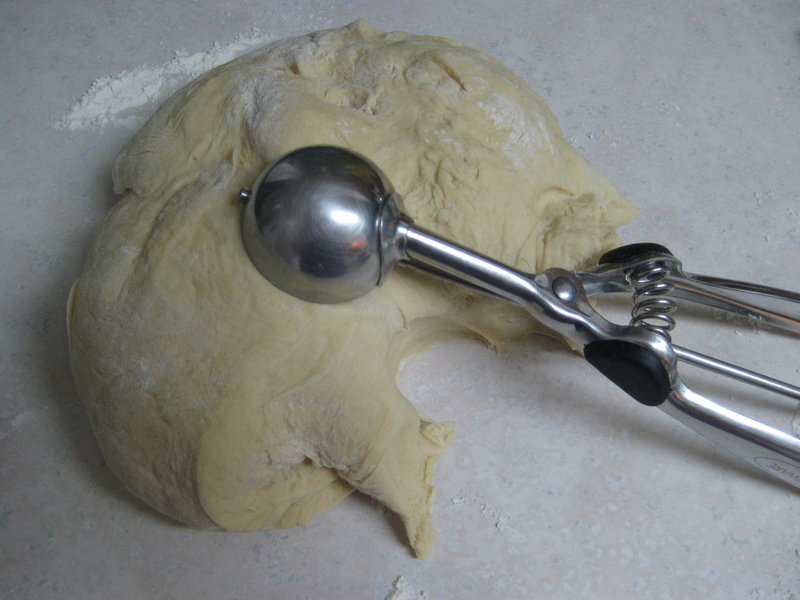 Change to the dough hook attachment and let the dough knead for about 8 minutes. 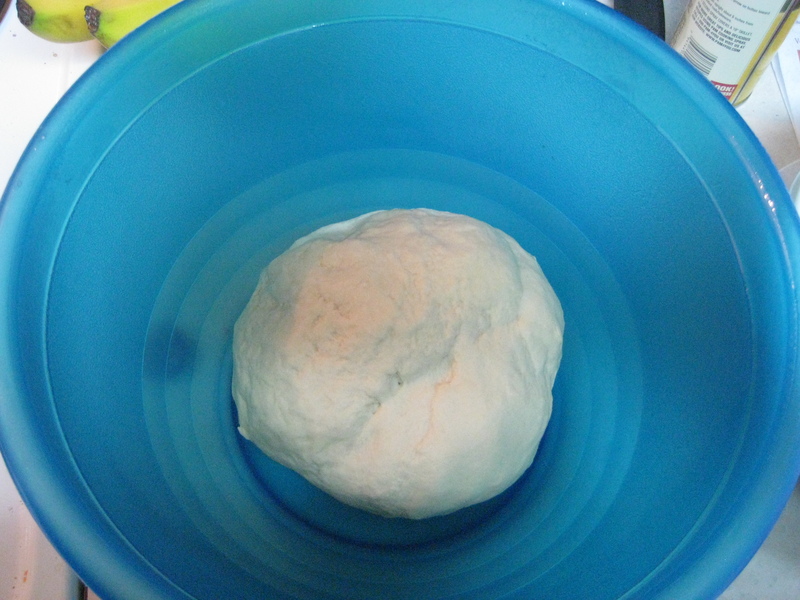 Add more flour if the dough becomes too sticky; it should not stick to the sides of the bowl at all. It should clean the bowl as it goes around. Your mixer will definitely get a workout. Mine was bouncing up and down even with the lock on! 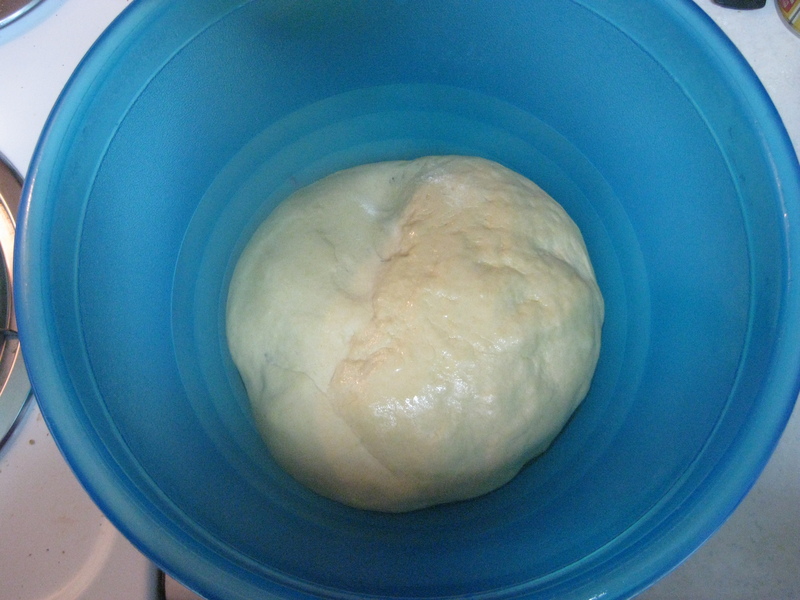 Remove the dough and shape into a smooth ball. Place in a bowl that has been sprayed with cooking spray. Spray the top of the dough with cooking spray and cover the bowl loosely with plastic wrap (or if you are out of plastic wrap a kitchen towel or cloth napkin will work just fine). Let stand in a warm place for 1 hour or until it has doubled in size. 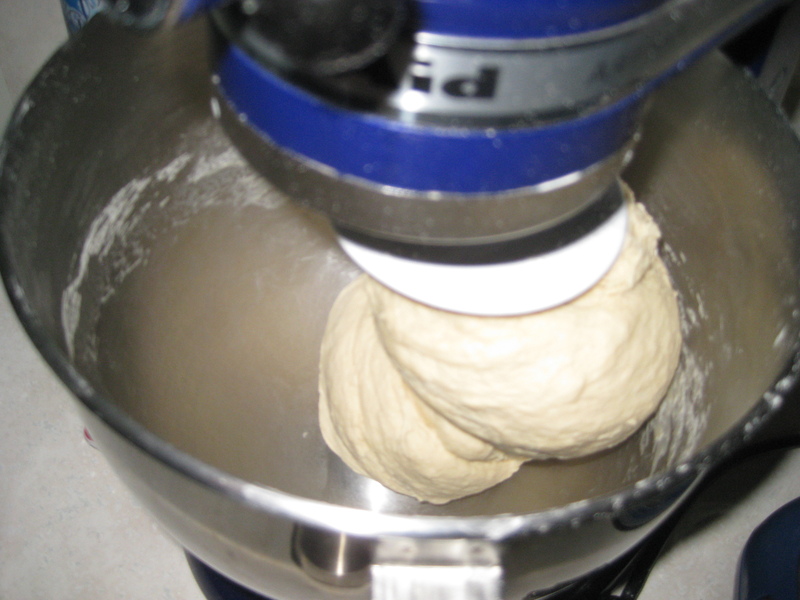 Remove dough from bowl and knead by hand a few times on a lightly floured surface. Shape the dough into 48 balls (a small cookie scoop works really well) and place onto a lightly greased cookie sheet. Cover loosely with plastic wrap or a towel and let rise again for 30 minutes. 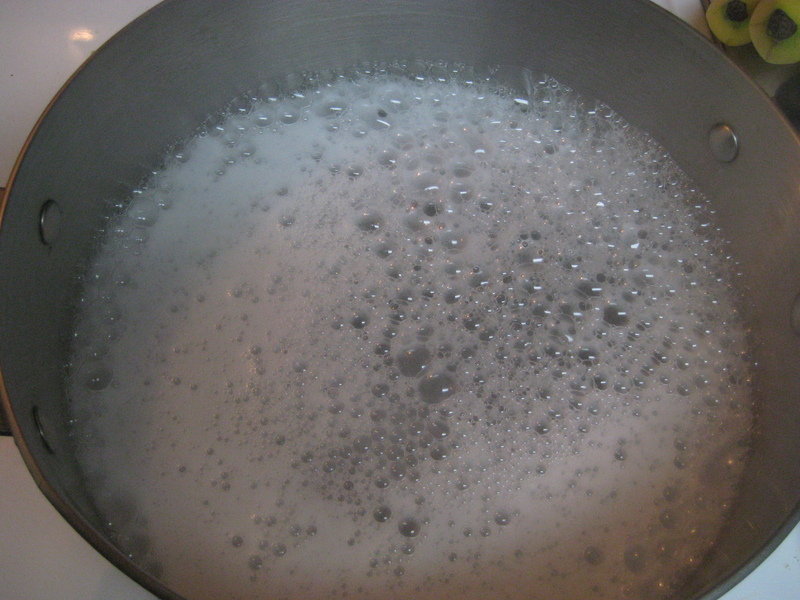 Bring water and baking soda to a boil in a large pot. 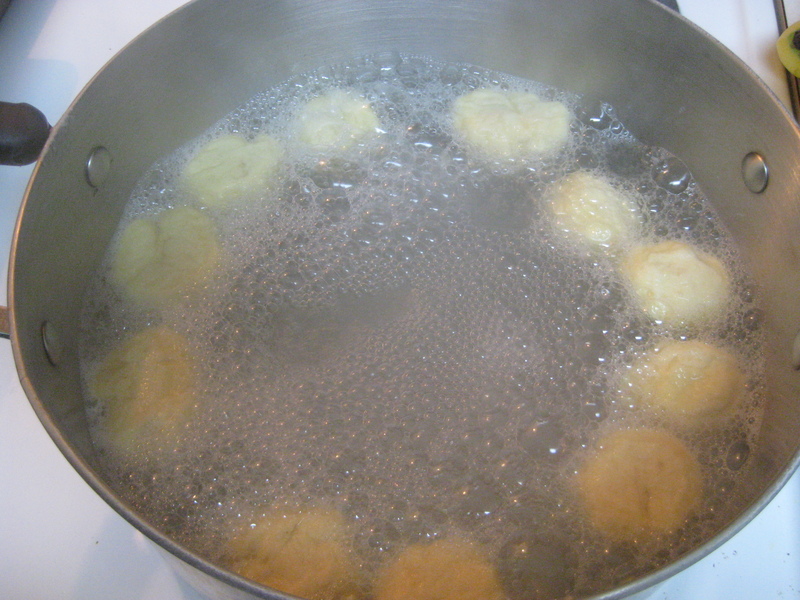 Add the balls to the boiling water a few at a time. Boil until they have puffed up. 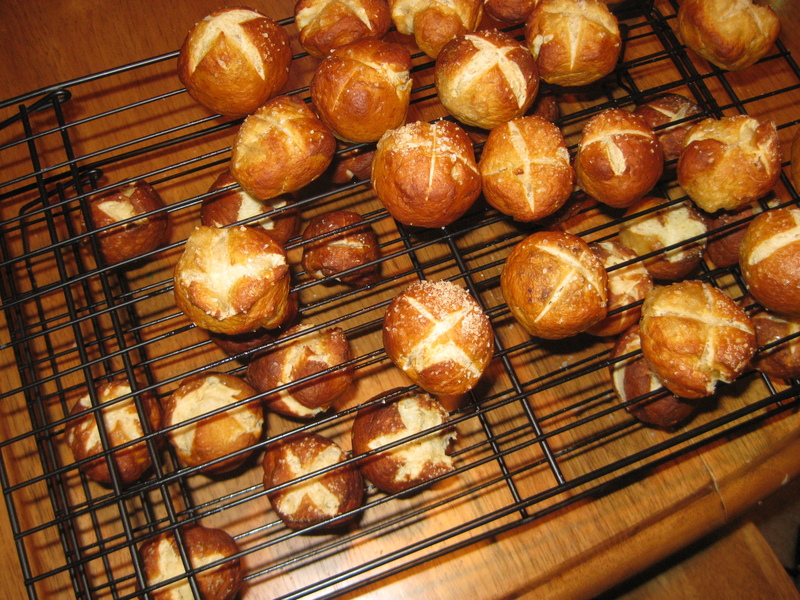 Keep turning them while cooking so they puff on all sides. Remove them from the boiling water and dry on a clean kitchen towel. Place balls on lightly greased cookie sheets 1-2″ apart. Use a small knife to place an “X” on the top of each. Sprinkle each with a pinch of coarse sea salt. Bake until they reach a nice golden brown (anywhere between 9 and 15 minutes). Serve with cheese or spicy mustard dip. My taste tester just got home and had a sample. He says that he is definitely a fan – I definitely like hearing that!